Victoria, Mahe (Seychelles) – November 14, 2017 (travelindex.com) – Another tourism trade fair has come and gone and this time it was the WTM (World Travel Market) of London. It is expensive to be at such events, but everyone in the world of tourism knows that it remains a must. Visibility is relevance and the drive for a successful tourism industry is this. Relevant holiday destinations are seen by Tour Operators and the press fraternity. Tour Operators look and compare existing & new products, the coming seasons prices and accessibility to the destination and then plan their next year’s programs accordingly. How is tourism growth being promoted in the Seychelles today? We put the question to Ambassador Maurice J. L. Lousteau-Lalanne, Minister for Tourism, Civil Aviation, Ports and Marine, Republic of Seychelles. There are two things. The first is in relation to air access to the Seychelles. For some time now, access from Europe to the Seychelles has always been via the Gulf. The European market has been crying for direct flights, and we have now managed, in 2017, to negotiate and have more direct flights to the Seychelles. As you know, Air Seychelles was the only carrier running three services a week from Paris, but now British Airways and Air France will start direct flights, beginning in summer 2018. So, that gives our main source market, which is Europe, much better connectivity, and will bring back different segments, especially from the UK market. Austrian Airlines will begin direct flights from Vienna this winter as well. In March 2018, the new Four Seasons Hotel will open its doors, and in 2019, Beachcomber will reopen. They had been operating an 80-room hotel, and they will reopen with a 295-room property. There are two other projects. One is on an island 60 nautical miles south of the Seychelles, a five-star 60-villa property. And Ritz Carlton will be opening a new resort in 2019. What makes the Seychelles different and unique? What’s happening with the Vanilla Islands project at the moment? It’s a project that started a long time ago with some European Union financing. We created an identity, and then it fizzled out, because we couldn’t get the air access sorted out. 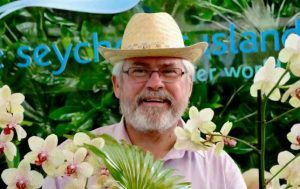 And then recently, the former Minister of Tourism of the Seychelles, Alain St.Ange rekindled the idea, and the Vanilla Islands today is more structured. In fact, we have a meeting here at IFTM of the Vanilla Islands. I think the first objective has to be to develop cruise tourism. This is more organic for our region. We need to invest some money and provide cruises between the Vanilla Islands. This is because we are islands at different levels of development in tourism. We cannot afford or expect all islands to reach the same level, so we have to start with something, and I think cruising lends itself very well. Then we need the air access. We need to think out of the box; we need to stop being over-protective of traffic rights between us, so that we can open up the market a bit more. That will be a second phase. We will need to get the COI – the Indian Ocean Commission – to agree to a more open sky policy within our region, then it will happen. There’s great potential. We all have different assets and complement each other, and it makes for a great holiday. Small Island Developing States (SIDS) are limited by their small land masses and must look to the ocean, and the opportunities arising therefrom, in order to expand their economy. It is essential that the population understands the concept of the Blue Economy in order to harness the opportunities that exist and will emerge in order to reap the optimum results of this development strategy. Although the phrase “Blue Economy” has been frequently used on national and international platforms, many people still struggle to understand the notion. This has prompted the innovative creation of a ‘Layman’s Guide to the Blue Economy’. The objectives of the Guide include: sensitising the layman about what the Blue Economy concept actually is, presenting the existing industries/sectors that form part of the Blue Economy, presenting examples of other opportunities that exist but have not been tapped into locally and globally, and identifying the local support for people who want to venture into business ideas in the Blue Economy. The James Michel Foundation, an NGO founded by the former President of the Republic of Seychelles, Mr James Alix Michel, has taken the lead in mobilising funding and sponsorship for the production of this Guide, which is expected to be published in the near future. This is an exciting new venture which will hopefully educate many on the concept of the ‘Blue Economy’ and encourage many to embrace it. Last month’s launch of a new guidebook for hiking mountain trails throughout Seychelles’ main islands comes as a welcome development for an aspect of Seychelles that doesn’t get a lot of attention, at least not compared to the islands’ world-famous beaches. The steeply rising crags that make up the inner islands of Seychelles – the only mid-ocean archipelago on earth of granite formation – offer not only wonderful vistas and some of the islands’ most photogenic scenes, but also host a treasure trove of endemic flora and fauna found nowhere else in the world. Hiking in Seychelles, co-authored by Rémy Ravon and Romain Latournerie with the support of the Seychelles Tourism Board, will undoubtedly be a handy companion for many intrepid adventurers keen on exploring the peaks and valleys of Mahé, Praslin and La Digue. For those with a true penchant for trekking through nature, there are additional ways to supplement one’s interest in the terrestrial side of the islands. Mason’s Travel, one of the islands’ prominent inbound tour operators, has been keen to develop hiking activities for its guests, but in a way that’s accessible for those who may not have had much experience. The company’s Peaks of Paradise excursion, for instance, includes a guided hike of about one hour along Mahé’s northwestern coast, which leads to the small hideaway of Anse Major beach where the guests then board Anahita’s 37-metre leisure catamaran for a lunch onboard. The passengers are then taken to Anse Diri in the Baie Lazare Marine Park for some additional snorkeling. Instead of trekking back the same way in the afternoon, guests can then enjoy a pleasant sail back to Victoria admiring the hillscape of the North coast of Mahe. On request, Mason’s Travel also regularly calls on local naturalists, especially for those tourists keen on birdwatching or interested in discovering some of the islands’ rarer endemic species, such as the jellyfish tree, of which only a few are known to exist in the world, and only in Seychelles’ higher elevations. To that end, an experienced guide can mean all the difference between a nice hike and a truly fascinating ecological experience. Someone who can recognise the surprisingly loud chirps of the sooglossidae, a tiny frog the size of a fingernail, or the calls of the elusive Scops Owl, will be in a much better position to find such hidden gems along certain trails, and provide insight into their behaviours. For those going it alone, there are a few tips to remember. First, always go with a travel buddy for safety reasons, and second, take your time. It’s when you stop to catch your breath and look around that you’ll start to see all manner of life around you in the forests, whether it’s the small endemic snails with jet-black shells or tiny hedghogs – known locally as tenrecs – scurrying off into the bushes. The Club Liberté’s Sushi Bar has the best of sushi, writes a repeat visitor to Seychelles. “Perfection, they say, is in the detail and perfection is difficult to attain. However, I would mark out the Club Liberté’s Sushi Bar as close to perfection as will be found on Mahe” a repeat visitor took the trouble to write. “It is all detail. It is the pointillism of food; the effect achieved through the accretion of tiny individual gestures. It’s good, it’s very good. If my intention were solely to make sure the place was full, this is maybe overkill. I could probably fill it by knocking on the doors of my neighbours and telling them the good news, as the sushi bar is small. Inside the Club Liberté Casino, there is a dedicated section of the bar that seats seven, spaces which can be booked. Plus there are several tables for two or more. The sushi bar is run by chef “itamae” Federico. Federico, who picked up the nickname “Derik” while an apprentice in Manila, served for a number of years as sushi chef at some pretty exotic places around the world. There is nothing exotic, praise be, about the food here. It is just straight up sushi – nigiri, temaki and maki – and sashimi (with the occasional hand roll). There are no hot dishes, not even miso soup. Well yes, there is the deep fried maki. Nor are there any desperate attempts to bring something arch and contemporary to the classic Japanese repertoire. It’s far better than that. All of it is made by Federico and Federico alone, right in front of you. If you are in a hurry, don’t be, perfection takes time. A plate is laid before you. A mound of pickled ginger and wasabi is placed to one side. The fun may now begin. Of course, sitting at the bar is more than just theatre. Sushi is best consumed seconds after it’s prepared, with the barely cool or room temperature fish being gently heated by the warm, vinegared rice. Federico may admonish diners who snap phone pics of the prepared sushi; there’s no photography ban here, he just wants you enjoy the fish, while it is perfect. While items can be ordered individually, there are also set menus or omakase, priced very reasonably. What’s in them is decided by the chef, depending on what’s good. We asked for octopus. He told me he had some, but we couldn’t have it. “I tasted it,” he said. “It’s not good enough.” Okay then. He said this without being condescending or grand. Indeed, there is nothing self-regarding or intimidating about Federico. Watching him work is a joy, but he’s also good company. A mid-ranged sashimi selection brought glistening pieces of snapper, bonito, tuna, salmon and the sweetest of sweet prawns. The nearest thing to adornment was the citrus juice, brushed lightly across pieces of snapper. The nigiri here is the whole package, which is to say the rice is exactly how you always wish it might be and so rarely is. It is the right side of just warm. The vinegared edge is there without being overstated. The grains cling to each other without being needy. On to these pillows, formed by hand in front of you, go snapper, or strips of salmon, or a piece of octopus which has been so finely sliced half the way through by his knife as to look like bleached-out marquetry. There is a delicate brush with soy. A strip of toasted seaweed is used to form a collar to hold back a cluster of orange roe. Marinated octopus, laid with a blob of sauce, disintegrates in your mouth to release its oils. I was once told that telling properly good sushi from the rest was a tricky business; the food was so very simple that difference could be measured in tiny points. I understood what they meant. Making it is a job for obsessives and so is eating it. So when the good sushi comes your way, you just know it. There are cheaper places to eat sushi on Mahe, and there may be hipper places too. But right now I honestly don’t believe there is any better place than Federico’s at the Club Liberté” the visitor went on to say. The Sushi Bar is open Tuesday to Sunday, 18h00 to 02h00. In the framework of the 2017 UN International Year for Sustainable Tourism for Development this conference wishes to provide a platform for tourism professionals, academics and practitioners from the Seychelles, other SIDS and the region to discuss an integrated practical approach to sustainable tourism in SIDS. For this event, the SSTF, and the University of Seychelles (Department of Tourism and Cultural Heritage) partnered up with the IUCN World Commission on Protected Areas’ Tourism and Protected Areas Specialist Group (TAPAS group), the Global Sustainable Tourism Council (GSTC) and the Paris Tourism Sorbonne Institute of Research and Higher Education in Tourism (IREST), to organize a regional conference on sustainable tourism in SIDS, which will combine academic tourism research with practical best practice examples. The conference aims at connecting the various stakeholders working and researching the environmental and socio-cultural development of the tourism industry, for constructive discussions and networking. With the GSTC as our conference partner and the SSTF pursuing a five-year vision for Seychelles to be certified sustainable by a certification body that is GSTC accredited, it is an important step for us to bring stakeholders together and exchange best practices, network and pave the way forward for the destination certification. Randy Durband, the CEO of the GSTC and an international sustainable tourism expert, will be the key speaker of the event and can share his vast experience with conference attendants. Nozipho P. Mdawe, Secretary General of PMAESA has confirmed from her PMAESA Secretariat in KPA Building No. 480038 of Kaunda Avenue, Kizingo in Mombasa, Kenya that the PMAESA Conference 2017 will be held in Victoria Falls in Zambia on the 22 and 23 of November under the theme:- Raising the Profile of Land-linked Countries in the Logistics and Maritime Value Chains. PMAESA is doing their bit to rewrite the narrative for Brand Africa through this meeting that is set to bring countries together for the consolidation of Cruise Africa in all its dimension and that includes on lakes and waterways of the continent. The Ports of Southern and Eastern Africa meeting will be opened on the 22 November with the KeyNote Address programmed to be delivered by Hon Inonge Mutukwa Wina, the Vice President of Zambia. The welcome addresses will be by Eng Meshack lungu, the Permanent Secretary of the Ministry of Transport of Zambia and by the Hon Eng Brian Mushimba, the Minister of Transport and Communications of Zambia. The first Technical Session of this PMAESA meeting will be on The Blue Economy and its impact on Socio-Economic Development and it will be Chaired by – Mr. Davies Pwele, General Manager, International Division, DBSA. Examining the link between trade, finance and industrial policies – what is the current picture in the region? The need to review policies to streamline trade and investment processes will be tackled bt Dr. Henry K. Mutai, Tralac Associate, TRALAC Trade Law Centre and What are the opportunities for women in the maritime & logistics sector in Land-linked countries? Ms. Meenaksi Bhirugnath-Bhookun, WOMESA Chairperson amongst many other interesting topics promising to make this PMAESA Conference 2017 a step forward for Brand Africa now the baby of minister Najib Balala, the Kenya Minister for Tourism and Head of CAF at the UNWTO. The Zambian Minister of Transport & Communications has said that it will be his honour and privilege to welcome delegates to the inaugural ports management association of eastern and southern Africa Investor Forum. “In the Forty Five years of PMAESA’s establishment we seek to more eagerly and earnestly address the issues which will accelerate the development of port and maritime infrastructure. The Forum is strategically organised to take place during the year when Zambia is appointed Chair of the United nations group of Land locked Developing Countries. The mission of the Chair is to work towards transforming all land locked countries into land-linked economically active countries. This is in fulfilment of Zambia’s strategy to be an integrated hub for Transport, Communications and meteorological Services in the Southern Africa region by 2030. Over the two days, we hope to unpack and discuss the priority port infrastructure projects with the view to accelerate their progress in reaching bankability. We will also share progress updates on the opportunities available in the water transport and maritime sector. It is my hope that you will find the platform of benefit as we deliberate and exchange knowledge across the sector. We are here to support and encourage dialogue amongst senior decision makers and the relevant authorities with the view to demonstrating the interconnectedness of the maritime, shipping, logistics and infrastructure development. We would like to extend our thanks and appreciation to our strategic partners, the Development Bank of Southern Africa for making this forum possible” Minister Hon. Eng. Brian C Mushimba, the Minister of Transport & Communications of the Republic of Zambia said.